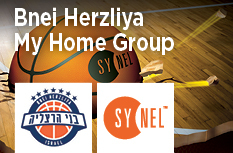 Synel the sponsor of Bnei Herzliya basketball team and proud of the privilege to support the sport and win! Bnei Herzliya yesterday won game against Ashdod 101-93! SYNEL continues to be the official sponsor of the group of Bnei Herzliya basketball team and proud of the privilege to support the Israeli sports Bnei Herzliya yesterday won the game against Sophia Academic 84-79! That bring Bnei Herzliya team to the first place in F league!